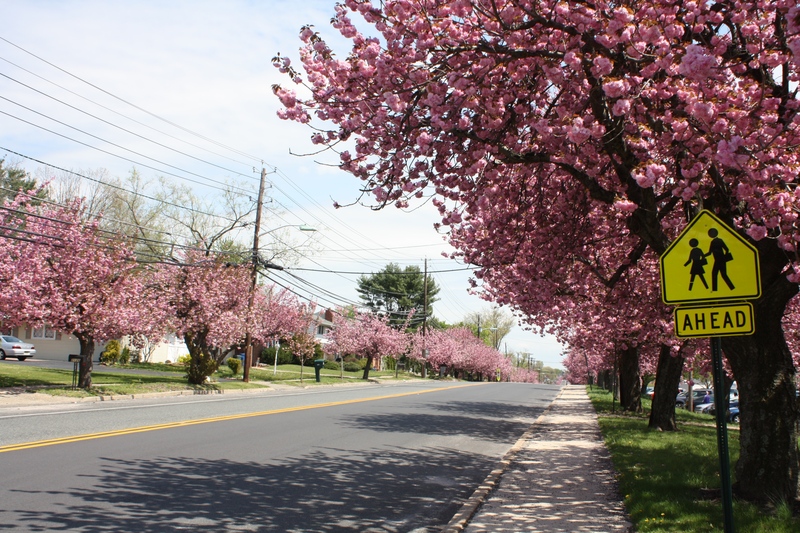 They’re one of Cherry Hill’s surest signs of spring: the magnificent, pink-and-white blooms that pop from the branches of the cherry trees along Chapel Avenue and throughout our community. Despite a later-than-usual bloom following a very cold winter, the Cherry Blossoms have finally made their spectacular return, and it’s truly a sight for all of Cherry Hill to behold and celebrate! Over the next week, the vibrant blossoms will help to brighten our community, and unite our residents in a celebration of the things that make this town such a special place to live, work and play. I encourage everyone to take a ride – or, better yet, walk – along the two-mile stretch between Haddonfield Road and Kings Highway. Bring your friends, your family, your children and even your pets, to breathe in the fresh air and enjoy the beauty these blossoms have once again bestowed upon our landscape. Residents who are new to Cherry Hill may not realize the important role the Cherry Blossoms have played in our community over the last 41 years. They were initially planted not just to improve the aesthetics of Chapel Avenue, but to build civic pride and create a sort of “Main Street” atmosphere in a sprawling suburb. That was the genesis behind the planting of the first trees, a tradition started by a small group of residents who wanted to bring our diverse community together to proudly celebrate all of Cherry Hill’s greatest attributes. Today, the blossoms have become one of Cherry Hill’s best-known landmarks; a gift that we should continue to preserve, protect and celebrate with future generations. The first cherry tree was planted in 1973, the year the community also held its first Cherry Blossom Parade – which, at one time, brought our residents, government, and area businesses and civic groups together to showcase our collective community spirit. Today, the tradition continues on a smaller, but equally beautiful scale, under the stewardship of one of the founders of the Cherry Blossom Parade, Joe Zanghi, with the help of the Cherry Hill Fire Department, which donates an afternoon each year to help plant new trees. Even four decades later, the cherry blossoms remain as a symbol of Cherry Hill’s greatness. The Township and Camden County came together last April to celebrate the 40th anniversary of the first cherry tree plantings, and to honor Joe for his continued stewardship of this spectacular avenue of blossoms. At the time, Joe’s message to the rest of the community was clear: It’s up to all of us to continue to support and celebrate the Cherry Blossom tradition, and to pass along its history to younger generations, so that they too can appreciate their special meaning in our town, and care for them as Joe and other residents have done for the last 41 years. As Mayor, I’m proud to share the story of the Cherry Blossoms on Chapel Avenue with our residents. The blooms will be around for another week or so; don’t miss out on the chance to experience their beauty firsthand. Seeing the blossoms always brings a smile to my face; it only takes a second to understand why they’re so special. For more information on the Cherry Blossoms and for photos of the trees and the Cherry Blossom Parades of the past, visit CherryBlossomsinCherryHillNJ.yolasite.com.